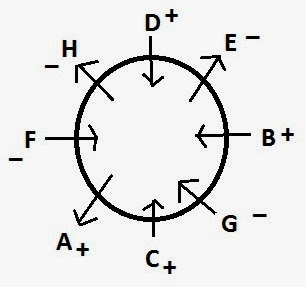 Eight friends – A, B, C, D, E, F, G and H are sitting around a circular table not necessarily in the same order. Three of three of them are facing outside (opposite to the centre) while five are facing the centre. There are equal number of males and females in the group. C is facing the centre, E is sitting third to the right of C. F is sitting third to the left of E. Three persons are sitting between F and B. The immediate niegbours of B are females. G is sitting third to the right of F. D is sitting third to the right of A. A is not an immediate neighbor of E. The immediate neighbours of E are males and facing the centre. The immediate neighbours of D are females and face outside. The one sitting third to the left of B is male. No female is an immediate neigbour of G.
2. How many persons are sitting between H and C when travelled from the left side of H? 3. Which of the following statements are true regarding H? 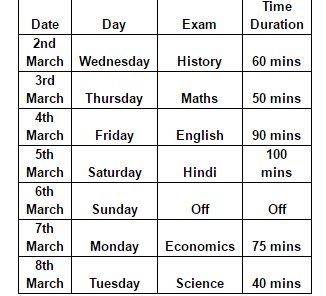 Six exams Maths, science, History, Economics, English and Hindi are to be scheduled starting from 2nd March and ending on 8th march with Sunday being an off day, not necessarily in the same order. Each of the exam has different time duration: 40 mins, 50 mins, 60 mins, 75 mins, 90 mins and 100 mins, again not necessarily in the same order. 8th march is not sunday and an exam of 40 mins is scheduled on that day. Maths exam is for less than 60 mins and is scheduled immediately before English exam. 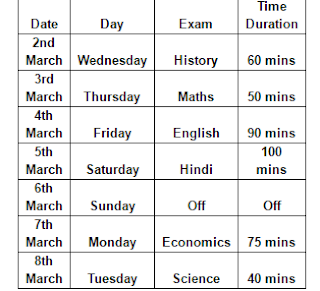 There are two exams scheduled between Hindi exam which is for 100 mins and History exam which is for 60 mins. English exam is before Sunday and there are two days between sunday and maths exam. Economics exam which is for 75 mins is not scheduled on 2nd march. The exam scheduled on saturday is of 100 mins. 7. How many exams are scheduled before sunday? 8. Which of the following combinations of Exam - Day - Time Duration is correct ? 9. What is the time duration of science exam? 10. On which day is Economics exam scheduled?